Rains have come more than three weeks late to much of Assam state, stunting the growth of tea buds and leaves. Tea prices are on the boil in India because of uneven monsoon rains in the country’s northeast. The monsoon arrived early over most of India this year, causing death and destruction in the northwest. But the rains have come more than three weeks late to much of Assam state, one of the world’s top tea growing regions. As a result, temperatures have stayed five to six degrees Celsius above normal, stunting the growth of tea buds and leaves during the crucial months of May and June, a period that usually yields the best quality of tea from shrubs. “Tea leaves have crumpled and appear reddish,” said Sujit Patra, joint secretary of the Indian Tea Association. Tea prices have already risen around 10% over the past month. Common varieties of tea are now priced around 130 rupees ($2.18) per kilogram at wholesale markets in Kolkata, industry officials say. They warn prices could rise further. Weather officials say a low pressure area has affected the distribution of the rains this year, causing floods over northern hill states and an unusually dry spell in the northeast. Rainfall in Assam and the adjoining state of Meghalaya so far in June is 57% below average, according to the state-run India Meteorological Department. 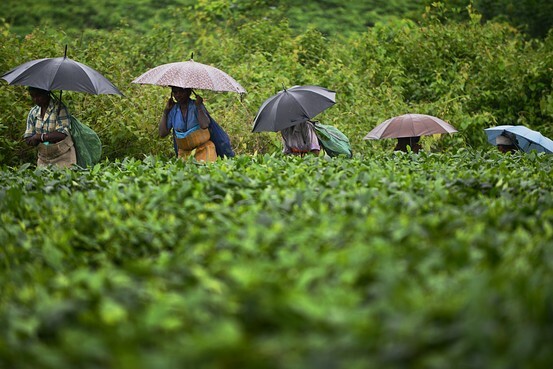 Forecasters expect rains to increase from this week, but that will only limit some of the damage given that tea output in May fell 7% from a year earlier, according to the Indian tea industry officials. “The total quantity of production is likely to be less this year, but it is difficult to estimate right now,” said D.P. Maheshwari, managing director of Jay Shree Tea and Industries Ltd., one of the largest tea producers in the country. India is the world’s second-largest tea producer. In 2012, it produced 1.13 million tons of tea. About 80% is consumed within the country.